It’s the grayest New York day I can remember. The weather doesn’t even deliver a heavy downpour or a single rumble of thunder; there’s just a light, no-umbrella mist and a low-lying fog that covers everything above the fifth floor of the buildings along Sixth Avenue. It’s Sunday. Somewhere, the Giants and Jets are losing football games. In Penn Station, soldiers stand around in camouflage fatigues with their M-16 rifles at chest level, their muzzles pointed straight at the ground. Bored-sounding announcements are issued to passengers over the station’s PA system: Do not leave your luggage unattended. Promptly report suspicious activity. In terror-alert parlance, perhaps it’s the most yellowish-orange New York day I can remember. 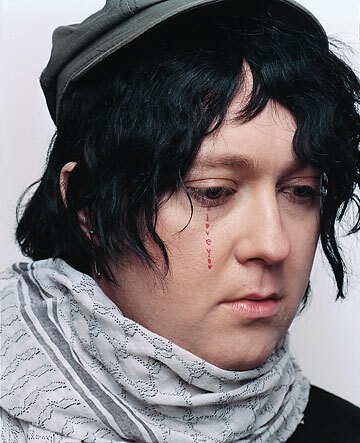 Antony Hegarty and I can’t even think of anything to do. After a quiet brunch, we shake off some of the lethargy and finally decide on a real plan of action: We’re going shopping for socks. Or maybe we’ll go to the pet store and stare at the caged puppies. But Antony needs black crew socks for an upcoming tour, so we begin trudging toward the fluorescent lights of Old Navy when we happen upon an outdoor flea market. The tables are cluttered with musty, worn clothing and overpriced antiques: rusted metal toys from the 1940s, a taxidermy squirrel, a box of old license plates, a framed gold record for Carly Simon’s “You’re So Vain” that had once belonged to a radio-station employee. We spy a tin button depicting the astronauts from Apollo 11 (the 1969 mission that took men to the moon) that reads, “Welcome Back To Earth.” Antony thinks this would make a nice gift for his friend, neo-folk guru Devendra Banhart. Then he picks up a dented Boy Scouts bugle, blurts out a few flat notes and considers buying it for Bianca and Sierra Casady, the avant-garde sister act that performs under the name CocoRosie. Across the Atlantic, some would rather have seen Antony wrapped in the Union Jack. In September, Antony won the Mercury Music Prize, an annual award given to a British or Irish artist whose album is deemed the best of the year. This caused a minor shitstorm for several reasons, foremost among them that 34-year-old Antony Hegarty, though born in Chichester, Sussex, hasn’t actually lived in England since he was 10. He has dual citizenship in Britain and the United States, but his undisputed home and creative base is New York City. It should be noted that winning the Mercury Prize is not exactly akin to being handed the keys to the kingdom. While PJ Harvey (who won in 2001) and Franz Ferdinand (2004) have taken home the award to bankable effect, have we heard lately from M People (1994) or Ms. Dynamite (2002)? There’s some notoriety involved with the statuette, which Antony describes as “a fossilized foot of a pterodactyl sticking out of a pile of lava, clutching a crystal ball.” After the ceremony, he pondered whether he should toss the vaunted prize into the River Thames and make a wish. Currently, 2005’s Mercury resides under a pile of laundry in Antony’s Chelsea—that’s Chelsea in downtown Manhattan, not Chelsea in southwest London—apartment. Earlier this year, BBC’s Radio One alerted Antony to a song request the station had received via e-mail from the South Pole. A researcher in an isolated arctic laboratory had heard “Hope There’s Someone,” the opening track from Antony And The Johnsons’ second album, I Am A Bird Now, and was so touched by the song he felt the need to write. A few months later, Antony discovered that Johnsons bassist Jeff Langston has a sister who’s been using “Hope There’s Someone” as part of a workshop she conducts for soul-seeking Christian women. It isn’t such a stretch; the song opens with a lyric that cuts to the heart of everybody’s deepest, most human, most lying-awake-at-night-trembling fear. And not a single word is wasted: “Hope there’s someone who’ll take care of me when I die,” sings Antony. Though some of Antony’s famous admirers—Reed, Banhart, Boy George and Rufus Wainwright—appear as guest vocalists on I Am A Bird Now, the album is the sole domain of its author. The persona behind songs such as “For Today I Am A Bouy” and “Bird Gerhl” is, appropriately or not, an issue: Antony is a man who sings like a woman about wanting to be a girl. Or that’s the simplified version; and even then, it’s kind of confusing. Antony says he prefers to be called transgender, which roughly means he identifies as a woman. However, he doesn’t necessarily present himself as a female in daily life or alter his body through surgery or hormone treatments. But what does it mean when so many people—gay and straight, good Christian women, Mercury Prize judges, South Pole scientists—connect with an album that plumbs the depths of a transnational, transgendered soul? When Antony talks about his childhood in the ’70s and ’80s, his English accent wakes up. He pronounces the decades daintily, with an extra-hard T: “seven-ties,” “aay-ties.” It was while watching television in Chichester that he was introduced to the more colorful fringes of pop music. The Hegarty family—Antony’s father is an engineer, his mother a photographer—left the U.K. for Amsterdam in 1981 and came to California a couple years later, moving around different parts of the Bay Area. Accustomed to singing in school and Catholic church, Antony found his American classmates oddly timid and unenthusiastic. Antony offers that “junior high is the most terrifying place in the world,” but then again, most of America probably shares that opinion. Attending a high school for the performing arts in San Jose, Antony was surrounded by friends who he says were stranger and more adventurous than the people he’d later meet in the avant-garde nightclubs, galleries and bars in New York City. When he does speak of certain difficulties and growing pains, it’s usually expressed as concern for others. As a student at UC Santa Cruz, Antony began writing, directing, producing and starring in musical plays. One of his first efforts was a John Waters-influenced melodrama called Sylvie And Meg. A more original production, staged a few years later in New York City, was titled Cripple And The Starfish. It’s set on a styrofoam island at the end of the world, after the land has been washed away by the greenhouse floods. At this point in the far future, humans have evolved into robotic beings, and the plot concerns the only two people left alive who still have hearts. “And they’re dysfunctional and co-dependent,” says Antony. After graduation, Antony took his act to downtown performance-art havens such as the Pyramid Club (an unassuming dive bar on Avenue A; “a two-floor death trap,” Rufus Wainwright calls it) and P.S. 122 (a school building that was converted to an arts space in 1980), becoming a regular fixture as a singer with a cabaret troupe called Blacklips. It was all good fun (one of Antony’s recurring characters was named Jennifer Honkytits), but after a while, you might say he was an island in a sea of fankicks. The gravitational pull of Antony’s voice—its tone imparting all the requisite drama and sorrow to ground even the flightiest plot—meant he often performed the function of deus ex machina: the Greek-tragedy role of a god who appears at the finale to explain what the hell just happened amid, in Antony’s case, a circus of feather boas, long wigs and eyelash glue. The ’90s were a long, hard slough, and Antony can proudly recall all the odd jobs that paid his rent. It’s one of the oldest showbiz chestnuts, the kind of shopworn joke that probably predates the Aristocrats and is tame enough to be retold by middle-aged suburban piano teachers: How do you get to Carnegie Hall? Practice, practice, practice. Maybe he was pushed. Antony formed the Johnsons in 1995 not as a band, but as another vehicle for staging his dramatic musicals. Success with the Johnsons earned him a fellowship from the New York Foundation for the Arts, which helped pay for the 1998 recording of debut Antony And The Johnsons. In 2000, the album was issued by Durtro, a label owned by David Tibet of goth/industrial outfit Current 93. The record is often referred to as The Blue Angel, due to its cover art featuring Antony—in white body paint, wrapped in sheer fabric and with a shaved head that makes him look like a Close Encounters alien modeling as the Madonna—against a sky-and-ocean backdrop. The I Fell In Love With A Dead Boy EP, its cover a Raphaelite tableau of an angel and demon presiding over Antony’s corpse, followed in 2001. Chris Swanson, co-owner of the Bloomington, Ind.-based Secretly Canadian label, purchased Antony And The Johnsons based on a staff recommendation on Aquarius Records’ Web site. (“Bloomington, Indiana, does not carry the Durtro catalog,” he deadpans.) Though Swanson found that the debut—a highly theatrical, diva-esque affair—polarized friends he played it for, he began writing to Antony and offered to reissue the album. It wasn’t an entirely uncharacteristic move for Secretly Canadian, a label that has the tenacity (or commercial indifference) to initiate a campaign to put the double-digit catalog of glam/garage obscurity Nikki Sudden back in print. The 2004 reissue of Antony And The Johnsons sold a few thousand copies, about the same number as its original pressing. But if Secretly Canadian stuck its neck out a little bit for an avant-garde oddity, Antony (who, to this day, doesn’t employ a manager) reciprocated by remaining with the label for I Am A Bird Now despite offers from larger record companies. Speaking about his recent fortune—five days after his Carnegie Hall date, he’ll perform on Late Night With David Letterman—Antony seems slightly embarrassed at all the attention. He crosses his eyes and wags his tongue to one side when confronted with a compliment. He’s a serene being; decidedly unflamboyant in his slightly baggy, always dark-colored clothes. He’s prone to thoughtful monologues about the collective subconscious and our responsibility to animals. When he says goodbye, he’ll give you a hug. Even if the world thinks he’s ready for prime time (or, at least, late-night TV), Antony isn’t so sure. Elder Edward Babb appears to be in his 60s or 70s, but he’s attempting a young man’s miracle: raising Carnegie Hall patrons from their assigned seats. Actually, it’s kind of working. The McCollough Sons Of Thunder, a Harlem-based 12-piece Pentecostal brass band, is blasting Carnegie’s crown molding with eight trombones and Babb’s gospel-preaching exhortations. Most people are clapping along, a few energetic souls jig in the aisles, and hardly anyone shouts an “Amen.” Yet everybody is feeling something, even if it’s the polar opposite of the suspended-in-time melancholy evoked by Antony’s music. It takes 2,804 souls to fill the main auditorium at Carnegie Hall, and the place is packed with more gay-culture icons than an Elton John celebrity roast. Reed and Wainwright are in attendance, of course, as are David Bowie and Bette Midler. After the Sons Of Thunder file offstage, the fans begin to call for Antony in their usual way—not by shouting or whooping or stomping their feet, but by trilling bird whistles. Antony introduces the evening’s special guest as “the keeper of every singer’s heart,” and that’s a pretty good place to begin with 80-year-old jazz vocalist Jimmy Scott. Born with Kallmann’s syndrome, a genetic condition that halted his physical and vocal development before puberty, the diminutive soprano was billed as Little Jimmy Scott when he began performing in the 1940s. His career was also stunted by an exploitative recording contract with the Savoy label; a 1962 album produced by Ray Charles was shelved because of legal complications (it was finally released, albeit in a limited edition, by the Rhino Handmade label in 2002 under the title Falling In Love Is Wonderful), and Scott disappeared from music—many presumed him dead—until the mid-’80s. Sire Records president Seymour Stein helped rejuvenate Scott’s career in the ’90s, and new recordings led to a Grammy nomination, an appearance in an episode of David Lynch’s Twin Peaks and the kind of reverence given to transcendent voices who’ve survived indignity and obscurity. Like Antony, Scott is a talent whose voice obliterates those who come to him as curiosity-seekers. At Carnegie, the fragile, tuxedo-clad Scott is propped up in a chair. No disrespect intended to the man, but from the balcony view, he looks like a ventriloquist’s dummy. Accompanied by piano, Scott performs three songs whose titles only convey a fraction of their heartbreak and devastation: “Why Was I Born,” “Motherless Child” and “Sorry Seems To Be The Hardest Word.” In the hands of lesser vocalists, these would be woeful dirges; Scott, who sounds like Billie Holiday wafting from a Victrola, makes them soar with defiance. Antony returns for his encore, responding to the applause with a tentative, “Um. Hey.” Then, “Hey, Lou?” Reed appears at stage right, straps on a guitar, and they ease into “Candy Says.” The small-framed, wiry-haired Reed is dwarfed by the foot-taller Antony, who looks like a visigoth by comparison and sings like an angel by any standard. “An unfortunate mixture of desolate, tortured camp and parched tastefulness,” writes the New York Times of Antony’s Carnegie Hall debut. The choice of the gospel brass band as the opening act is termed “a hipster misfire.” Antony is described as “a teenager who can communicate only through music,” and his physical tics are said to be awkward. Antony hasn’t yet arrived at the point in his career where he pretends to ignore his press; besides, he’s been the beneficiary of some extraordinary features, reviews and critical plaudits. 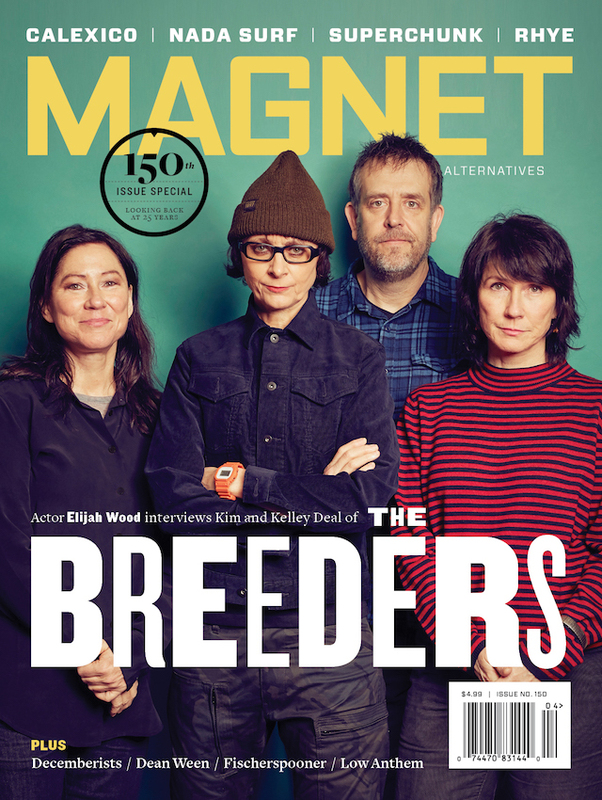 MAGNET has no method of quantifying this, but we’ll assert that no musical act in 2005 garnered more column inches of press while selling as few records as Antony And The Johnsons. Not in America, at least. While I Am A Bird Now has shipped more than 350,000 copies worldwide, the album has SoundScanned a mere 25,000 copies in the U.S. at the time of this writing. Swanson recalls the first flare-up of interest occurred in Australia in January 2005, after Antony appeared at the Sydney Opera House for a Leonard Cohen tribute. (A documentary about the event, Leonard Cohen: I’m Your Man, premiered at the Toronto Film Festival in September; it also features performances by U2, Nick Cave, Jarvis Cocker, Beth Orton and Martha and Rufus Wainwright.) Swanson expects American audiences will catch up with the rest of the world, and Secretly Canadian owns the rights to release Antony’s next record. One fledgling idea for the follow-up to I Am A Bird Now is a covers album. Listeners—and consumers—usually groan at such a prospect, but someone like Antony (who covered Cohen, Nico and avant-electronic pioneer Moondog at Carnegie) could reverse that trend. As for the Times review, the paper of record misinterpreted the events that occurred the night of October 13. Antony is no hipster; while he pals around with Banhart and CocoRosie, he’s oblivious to, say, the Strokes. (“Are they gay?” he asks innocently. “They’re not? Well, they should be.”) Maybe his musical arrangements are too tasteful (what’s a rock magazine to do, feign expertise on chamber orchestras? ), but elements of camp were deliberately downplayed. When we next hear the bird whistles, Antony appears on an auditorium stage at Cooper Union, an exclusive art/architecture/engineering college in the East Village. Tokion magazine has invited him to speak about creativity in music. He’s accompanied by CocoRosie and Kembra Pfahler, a veteran performance artist, fashion designer and singer for rock band the Voluptuous Horror Of Karen Black. Pfahler also happens to be covered in pink body paint, dressed in a see-through kimono, wearing thigh-high leather boots and made up like a kabuki alien princess. But something far more interesting happens during the audience-participation portion of the event, in which Antony channels the sound of the room, pulling in everything he can feel from the suddenly silent air. It’s meant as a simple exercise to kickstart a song, and he first leads the audience through a low drone of hums. CocoRosie joins in with feline cries, and Antony invokes what he calls the Otis Redding principle of “shaking it,” and the sound shifts to monk-like chanting. Finally, he alters the melody (“the turning principle: as it turns, it sheds its ego”), and the shape of a song to come appears in the auditorium. After the lecture, Antony retreats to a Cooper Union conference room. He’s visibly shaken, and he nervously disappears into a nearby bathroom. I ask Bianca Casady what all that ghost-behind-you stuff was about. “It’s about pure surrender,” she replies. When interviewed a few days later, Antony dismisses any talk about ghosts or channeling the psychic silence of an audience and then forming it into a song. “I was just excited,” he says. In any event, demonstrating your intimate creative process to a roomful of strangers is a spooky thing. Antony already reveals so much of himself, unwittingly draped in so many flags and carrying so many torches: for the lonely, the oppressed, the everyday sad, the caged birds. It’s a weight he can neither shoulder nor fathom. He prefers to wonder how the rest of us are doing.